"The Weight/I Shall Be Released"
In 2000 the album was rereleased with additional outtakes from the recording sessions, and in 2018 a "50th Anniversary Super Deluxe" edition was released with a new stereo mix by Bob Clearmountain. The Band began to create their distinctive sound during 1967, when they improvised and recorded with Bob Dylan a huge number of cover songs and original Dylan material in the basement of a pink house in West Saugerties, New York, located at 56 Parnassus Lane (formerly 2188 Stoll Road). The house was built by Ottmar Gramms, who bought the land in 1952. The house was newly built when Rick Danko found it as a rental. Danko moved in along with Garth Hudson and Richard Manuel in February 1967. 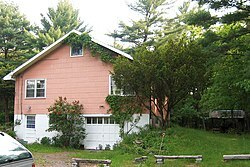 The house became known locally as "Big Pink' for its pink siding. The house was subsequently sold by Gramms in 1977, and since 1998, it has been a private residence. Though widely bootlegged at the time, the recordings Dylan and the Band made were first officially released in 1975 on The Basement Tapes, and then released in their totality in 2014 on The Basement Tapes Complete. By the end of 1967 The Band felt it was time to step out of Dylan's shadow and make their own statement. The Band's manager Albert Grossman (who was also Dylan's manager) approached Capitol Records to secure a record deal for a group still informally described as "Dylan's backing band". Alan Livingston at Capitol signed The Band—initially under the name The Crackers. Armed with news of a recording deal for the group, they lured Levon Helm back from the oil rigs where he had been working, to Woodstock where he took up his crucial position in the Band, singing and playing drums. Helm's return coincided with a ferment of activity in Big Pink as the embryonic Band not only recorded with Dylan but also began to write their own songs, led by guitarist Robbie Robertson. After meeting with producer John Simon, the Band started to record their debut album in Manhattan at A&R Studios, on the 7th floor of 799 7th Avenue at 52nd Street in the early months of 1968. The Band recorded "Tears of Rage", "Chest Fever", "We Can Talk", "This Wheel's On Fire" and "The Weight" in two sessions. Robertson has said that when Simon asked them how they wanted it to sound, they replied, "Just like it did in the basement." Capitol, pleased with the initial recording session, suggested that the group move to Los Angeles to finish recording their first album at Capitol Studios. They also cut some material at Gold Star Studios on Santa Monica Boulevard. The songs on Big Pink recorded in L.A. were "In A Station", "To Kingdom Come", "Lonesome Suzie", "Long Black Veil" and "I Shall Be Released". Dylan offered to sing on the album, but ultimately realized it was important for the Band to make their own statement. Instead, Dylan signified his presence by contributing a cover painting. Barney Hoskyns has written that it is significant the painting depicts six musicians. The cover of Music From Big Pink was intended to establish the group as having a different outlook from the psychedelic culture of 1968. Photographer Elliott Landy flew to Toronto to photograph the assembled Danko, Manuel, Robertson, and Hudson families on the Danko chicken farm. A photo was inserted of Diamond and Nell Helm, who lived in Arkansas. The photo appeared on the cover with the caption "Next of Kin".. The overall design of the sleeve is by Milton Glaser (who also did the poster that was packed with the 1967 Bob Dylan's Greatest Hits). The initial reception to the album was positive, though sales were slim. It received praise for the organic quality of the instrumentation, which had been recorded live without overdubbing. In Rolling Stone, Al Kooper's rave review of Big Pink ended with the words, "This album was recorded in approximately two weeks. There are people who will work their lives away in vain and not touch it." which helped to draw public attention to it ( Rolling Stone even referred to them as "the band from Big Pink" instead of just "the Band"). The fact that Bob Dylan wrote one and co-wrote two of the songs on the album also attracted attention. Robert Christgau was less enthusiastic in The Village Voice. He credited the music's original evocation of "country-soul feeling without imitating it" and the "human roughness around the edges", but ultimately found much of it morose and boring to listen to, later arguing that the music's lack of energy reinforced the "metaphorical impenetrability" of the lyrics. In 1968, "The Weight" peaked at #63 on Billboard's Hot 100 singles chart in the US. The song was a bigger hit elsewhere, peaking at #35 in Canada, and #21 in the UK. The album peaked at #30 on Billboard's Pop Albums chart in 1968, and then recharted as a #8 hit on the Top Internet Albums chart in 2000 (see 2000 in music). "The Weight" gained widespread popularity, from the Band's performance of it at Woodstock on 17 August 1969 and due partially to its inclusion in the film Easy Rider, though it was omitted from the soundtrack because of licensing issues. A cover version by the band Smith was included on the soundtrack album instead. In 2003, the album was ranked number 34 on Rolling Stone magazine's list of the 500 greatest albums of all time. The laid-back feel of the album attracted the attention of other major artists. For example, Eric Clapton cites the album's roots rock style as what convinced him to quit Cream, and pursue the styles of Blind Faith, Delaney and Bonnie, Derek and the Dominos, and his debut album. George Harrison was also impressed by the album's musicianship and sense of camaraderie, and Roger Waters called it the second "most influential record in the history of rock and roll", after Sgt. Pepper's Lonely Hearts Club Band, and said that it "affected Pink Floyd deeply, deeply, deeply." According to Terry Burrows, the album spawned the Americana genre, while music academic Chris Smith said its songs laid the groundwork for roots rock music. The original LP record issue included a gatefold cover in 1968, duplicated 40 years later in 2008 as a remastered 180 gm LP. On compact disc, it was remastered as a gold CD in 1989, as a DVD-audio in 2001 and as a remastered numbered edition SACD in 2009. On August 29, 2000, it was reissued by EMI Records as a standard compact disc with nine bonus tracks as listed below. In 2012, Mobile Fidelity released a remastered, numbered, limited edition, Half-speed Mastering from the original master tapes, 180g LP pressed at RTI. In 2018, a 50th Anniversary Edition was released with an entirely new stereo mix and 5.1 mix by Bob Clearmountain, mastered by Bob Ludwig. It also included some of the additional tracks from the 2000 re-release, and a new vocal-only mix of I Shall Be Released. 5. "This Wheel's on Fire"
The Weight peaked at #35 in Canada and #21 in the UK. ^ Bowman, Rob. "History of The Band: The Debut Album". theband.hiof.no. Retrieved 2009-11-03. ^ Wilson, William. "Historic Buildings in Rock'n'Roll History". rocknrolltravel.co.uk. Retrieved August 5, 2016. ^ a b Ruhlmann, William. Music From Big Pink at AllMusic. Retrieved 2010-06-19. ^ "The Band: Music from Big Pink". DownBeat: 66. October 2001. ^ Larkin, Colin (2011). "Funkadelic". Encyclopedia of Popular Music (5th ed.). Omnibus Press. p. 2390. ISBN 0857125958. ^ Scherman, Tony (September 1, 2000). "Music Review: 'The Band'". Entertainment Weekly. Retrieved April 16, 2019. ^ "The Band – Music from Big Pink CD Album". CD Universe. Retrieved July 5, 2011. ^ Bauldie, John (April 1996). "The Band: Music from Big Pink". Q: 120. ^ "The Band: Music from Big Pink". Rolling Stone: 69–73. August 31, 2000. ^ Brackett, Nathan, with Hoard, Christian (eds) (2004). The New Rolling Stone Album Guide (4th edn). New York, NY: Fireside. p. 42. ISBN 0-7432-0169-8. ^ "The Band: Music From Big Pink Album Review". Retrieved 22 March 2019. ^ Viney, Peter. "The Band: Album Ratings". The Band website. Retrieved 2010-06-19. ^ Stephen Thomas Erlewine. Pitchfork. "Music from Big Pink." September 2018. ^ a b Christgau, Robert (December 1969). "In Memory of the Dave Clark Five". The Village Voice. Retrieved October 31, 2017. ^ Kooper, Al (10 August 1968). "Records". Rolling Stone. Retrieved 2 October 2013. ^ Christgau, Robert (December 22, 1975). "Christgau's Consumer Guide". The Village Voice. Retrieved October 31, 2017. ^ "The 500 Greatest Albums Of All Time". Rolling Stone. Rolling Stone. 2010-01-12. Retrieved 2010-06-19. ^ "Roger Waters quote re "Music from Big Pink" - Progressive Rock Music Forum". Progarchives.com. Retrieved 2014-03-07. ^ Burrows, Terry (2015). The Stratocaster Manual: Buying, Maintaining, Repairing, and Customizing Your Fender and Squier Stratocaster. Voyageur Press. p. 176. ISBN 0760349223. ^ Smith, Chris (2009). 101 Albums that Changed Popular Music. Oxford University Press. p. 61. ISBN 0195373715. ^ Morris, Chris (24 August 2018). "Album Review: The Band's 'Music From Big Pink: 50th Anniversary Edition'". Variety. Retrieved 31 December 2018. Hoskyns, Barney (1993). Across The Great Divide: The Band and America. Viking. ISBN 0-670-841447. Landy, Elliott (2015). The Band Photographs 1968-1969. Backbeat Books. ISBN 978-1-4950-2251-7.